Blue Flag International is happy to announce the sites awarded for this coming season 2018. We would like to congratulate all countries and municipalities that have successfully awarded the Blue Flag to local beaches, marinas and sustainable boating tourism operators. A number of countries have sent us information and pictures of the awarding ceremonies. We would like to share stories and pictures from Spain, The Netherlands and Turkey with you. 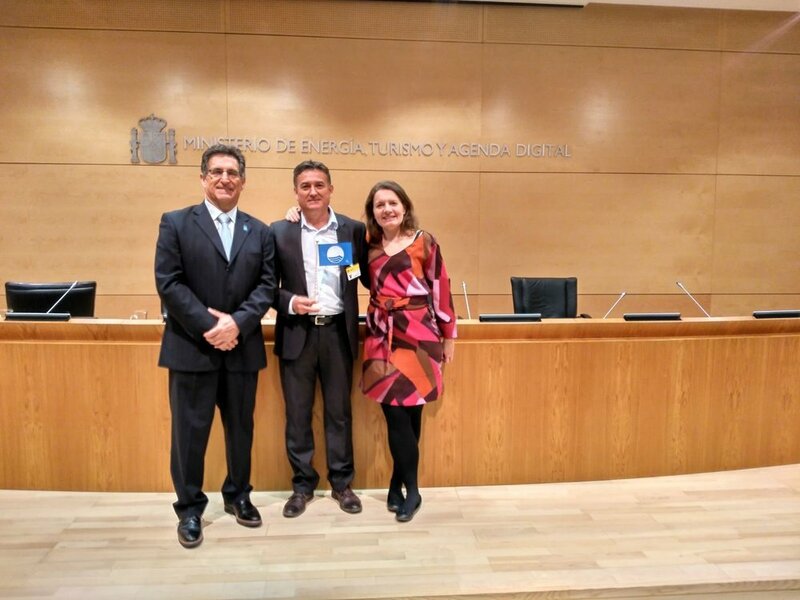 From left to right: Jose Palacios (VicePresident of ADEAC), Cayetano Ramos (Major of Orellana la Vieja, the first Blue Flag in continental waters in Spain) and Virginia Yuste (National Operator for Blue Flag in Spain). On the 8th of May, the press conference for the announcement of the Blue Flag sites 2018 in Spain was held More than 30 TV channels, newspapers and radios attended the conference which had great media coverage. The conference, which was covered by national and regional channels, was held in the auditorium of the headquarters of the Ministry of Tourism in Madrid. The conference was hosted by the Secretary of State for the Ministry of Tourism, Matilde Asian, the Director of the Sustainability Program from WTO, Dirk Glaesser, together with the President of ADEAC, Jose Palacios. ADEAC is the organization representing the Blue Flag programme in Spain. With 590 beaches, 101 marinas and five sustainable tourism boating operators awarded, Spain is the country with the highest total number of Blue Flag awarded sites. On the 3rd of May the Netherlands organised their 31st National Blue Flag season launch celebration at Uitgeest marina. The Dutch jury president was able to announce that a total of 185 sites that received the award. Of these sites in the Netherlands, 123 were marinas and 62 beaches, of which eight were inland beaches. Since half of the Netherlands’ surface is below sea level, there are a lot of marinas. No wonder that this country has the most Blue Flag awarded marinas in the world. In addition, the municipality Sudwestfryslan celebrated having eight Blue Flag marinas. These are actually the most awarded marinas within a municipality’s borders. Six successful candidates have been awarded the Blue Flag since it’s representation in the Netherlands and received the Blue Flag for the 31st time in a row. The Blue Flag season 2018 was opened by Uitgeest’s mayor and the national jury president by hoisting a Blue Flag sail on a big spinnaker, as seen in the photo above. FEE Turkey organized the 8th National Training Seminar for Marina Managers and Blue Flag responsible individuals. In total around 60 people attended the seminar in Bodrum (Turkey), including 22 awarded marinas. The Ministry of Tourism, the Ministry of Environment, the Marine Tourism Association, the Chamber of Shipping, the Ministry of Maritime Affairs and Sustainability Experts, attended and held presentations and workshops. In addition, FEE Turkey, prepared the 6th National Training Seminar for Beach Managers, which was concluded with an examination. During 29-30 March 2018, 170 beach managers from 59 coastal cities in Turkey successfully passed the exam. After the national training seminar, 10 beaches and 3 marinas were awarded for collecting the most waste batteries within in a year. This was organised in collaboration with TAP-Waste Batteries Collection Association, who are licenced to collect all waste batteries in Turkey. Click here to read about the Blue Flag awarding ceremonies for 2018 season: Part 1.